Amidst protests over her role deporting immigrants, former US Homeland Security chief Janet Napolitano was confirmed by the regents last week as UC president, the first woman in the job in the system’s 145-year history. At her request, Napolitano’s salary was set at $570,000 a year – that’s $21,000 lower than out-going president Mark Yudof. Still, it’s a hefty raise given the $200,000 she made as a Cabinet secretary. Perhaps the most important item on Napolitano’s agenda will be UC’s mortgaged future, according to Berkeley PhD candidate Charlie Eaton. In a San Francisco Chronicle op-ed, he cited UCB’s multi-million dollar stadium boondoggle and UC’s recent lawsuit alleging manipulation of interest rates as two key financial indicators. UC’s lawsuit, writes Eaton, “could recoup hundreds of millions of dollars from Wall Street and is a first step for putting students before risky borrowing and investments. But the regents’ about-face underscores the need for a comprehensive review of UC borrowing practices,” including more transparency and broadening participation in governance. endowment, Berggren was also "acting treasurer and vice president for investments." Could her resignation be related to UC's lawsuit against more than 20 global financial institutions for rate manipulations that "negatively affected" UC's retirement pool? For UC staff without union contracts, employee pension contributions increased from 5 to 6.5 percent this month. For administrative professionals (APs), that amounts to about half the raise most just received. 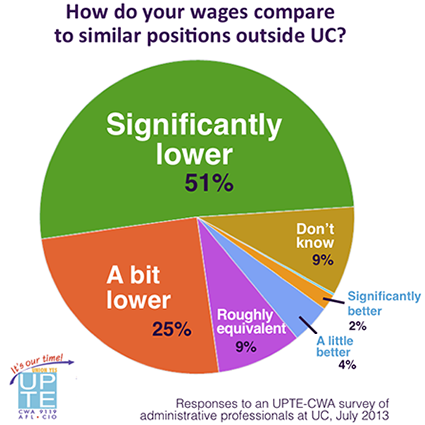 An UPTE survey of APs found that over three-quarters felt their wages at UC were lower than similar positions outside the university. Last week, the regents approved an increase to 8 percent of salaries starting next July 1, reports the San Francisco Business Times. UCSB professor Christopher Newfield explains that while the increases bolster the pension fund, “each also amounts to annual cuts to staff and faculty take-home pay." UPTE’s three represented units –researchers, techs and health care professionals – are in bargaining to preserve a healthy single-tier pension system. UC’s Board of Regents has agreed to pay $4.5 million to settle a racial discrimination lawsuit filed by an African American surgeon at UCLA's medical school, reports the Los Angeles Times. Dr. Christian Head alleged that the university failed "to prevent discrimination, harassment and retaliation" against him, "that he was retaliated against for filing complaints through normal channels and was denied teaching opportunities." The regents have confirmed UC Berkeley undergraduate Sadia Saifuddin as the 2014-15 student regent. A Pakistani-American, Saifuddin is the first practicing Muslim to serve in the position. She drew some objections because of her participation in a divestment campaign over the Israeli occupation of Palestinian territories. Political pressure on the regents matters. “You don't want to alienate the people who make decisions about the funding,” was how a UC spokesperson explained why proposed increases to 29 graduate programs were narrowed down to just 8 programs at the board’s last meeting. Regents were prepared to hike fees on 29 out of the 60 graduate professional programs UC offers, but postponed that action for a year after being leaned on by Governor Jerry Brown. It may be about Illinois, but the implications are national. A new report by faculty at the University of Illinois, “The State of Working Illinois 2013: Labor in the Land of Lincoln,” examines unemployment, wage stagnation, and income in the state of Illinois, but it concludes that decline of unionization has led considerably to income inequality and increased strain on the social safety net, as union workers generally have higher wages, better benefits, and more financial security.